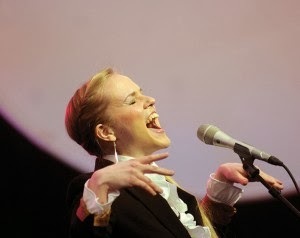 This week Hanna Paulsberg Concept are doing a split tour with Estonian singer Kadri Voorand and her quintet in Norway. Tomorrow we start in Trondheim, and we are playing at Dokkhuset at 19:00. In april next year HPC will go to Estonia and do a split tour with Kadri's band up there as part of our release tour. I am very happy that we made this exchange happen, we've been talking about it since we first met in the European Youth Jazz Orchestra last year. A special thanks to Midtnorsk Jazzsenter and the Estonian Jazz Union for helping us with this! Kadri's band (in addition to herself) consists of: Mihkel Mälgand - bass, Jussi Kannaste - saxophone, Ville Pynssi - drums and Joel Remmel - piano.